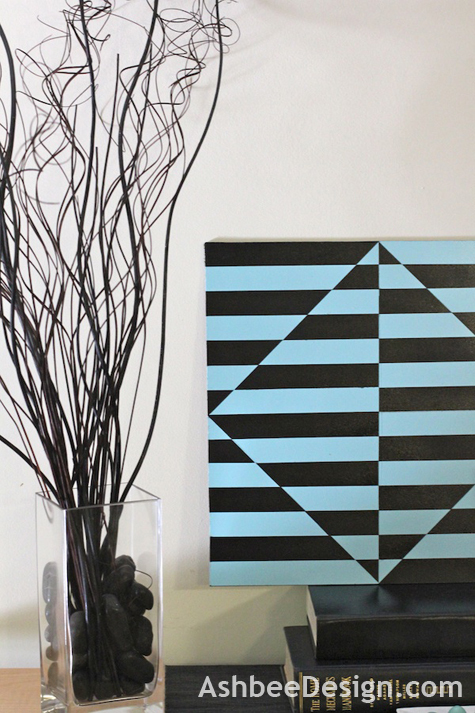 Design Sponge sponsored a Blue Painter's tape project last month and I was inspired to create. This month I have discovered that my project wasn't selected in the final 20 so I can instead share it with everyone on my blog. After looking at my project you can hop on over to Design Sponge and look at the other entires. Still waiting to see the final winner. 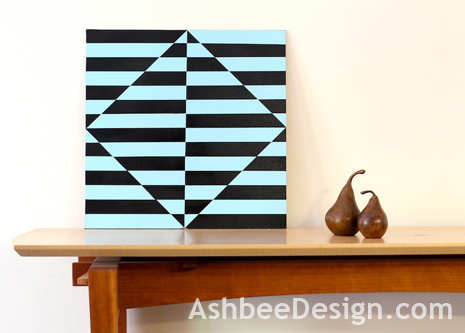 My art students back in the 70’s were enthralled by the optical art work of Victor Vasarely. I developed a lesson using masking tape as a paint block that they used to help them create paintings with sharp lines and strong optical patterns. They were often frustrated because the paint always leaked under the edges of the masking tape requiring a steady hand to repair. When blue painter’s tape hit the market and was advertised as having the edge lock, I thought back to my students from decades ago and knew this magic tape would have made their end projects so much easier. With this project I decided to test the materials to see if in fact, it would make creating quick, visually strong, optical paintings easier. I was right. It was a breeze. 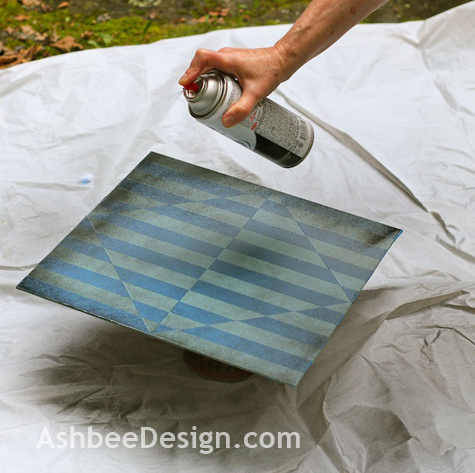 Spray paint in two contrasting colors (I used black and aqua. Complimentary colors also create especially strong optical effects (red/green or orange/blue) and just about any light color creates a striking effect with black. Spray paint it using the lighter of your two colors. Working in a well ventilated area build up many light coats. The number of coats depends on how light your color is and the coverage but keeping putting on coats until the surface is a solid color. 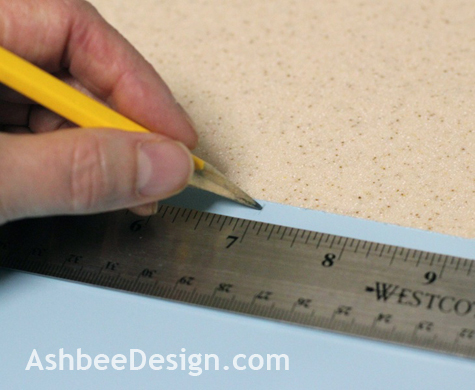 Be sure to paint the edges as well as the flat surface. Allow to dry thoroughly. I let mine dry over night. Find the mid point of two opposites sides and draw a straight line across the surface there. 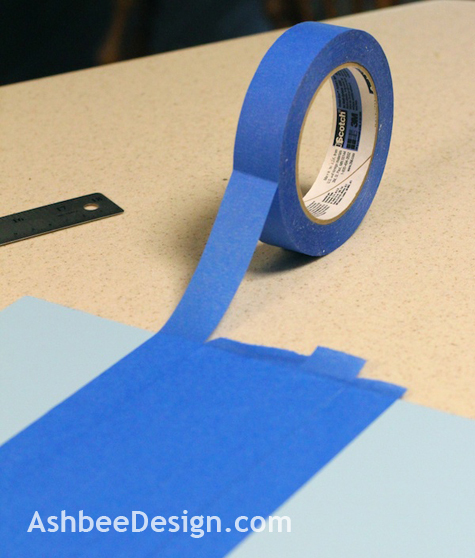 Apply the first piece of Scotch Blue Painter’s tape to the surface with its edge lined up to the line drawn across the midpoint. 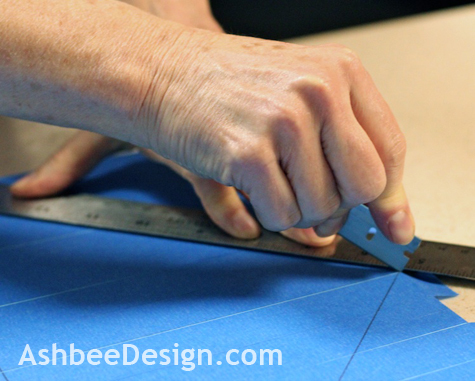 The tape should go completely from edge to edge with about ½” over hanging to wrap around to the back. Apply the second strip of tape exactly parallel to the first. Try to not leave any space between, but also don’t let them overlap. Press each piece firmly in place giving special attention to the edges. 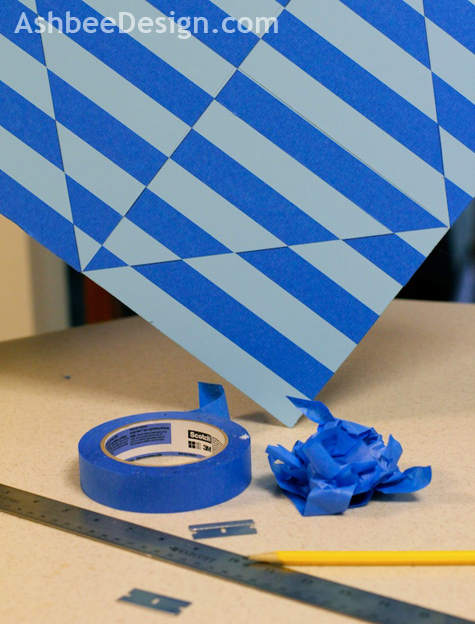 Cover the entire surface with even strips of tape. Fold the ends over on to the back of the board. 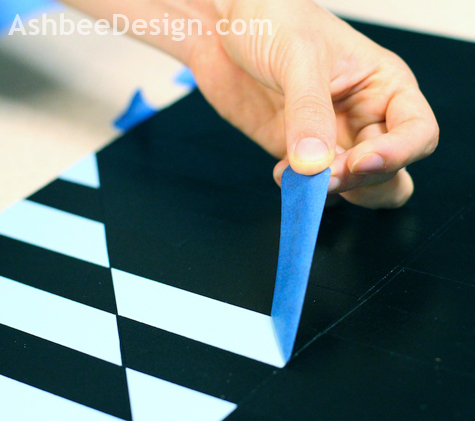 Draw a geometric design onto the tape. My design was created by measuring the mid point of each side and connecting them thus creating the diamond shape within the square. Other shapes can be used as well. Use a ruler or compass and be precise. 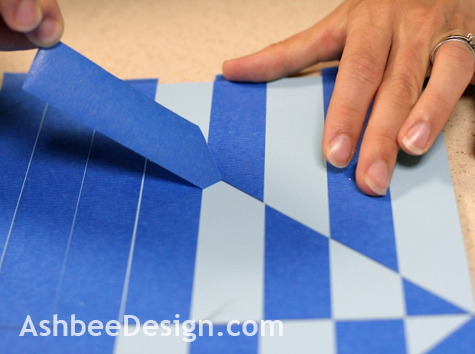 Using either a single-edge razor blade or Exacto knife and a metal ruler, cut along the lines you just drew on the blue tape. The goal is to apply enough pressure to cut through the tape cleanly. Peel off every other piece of tape. Again make sure all edges are sealed tightly by pressing them all. Fifty percent of your design should be removed. 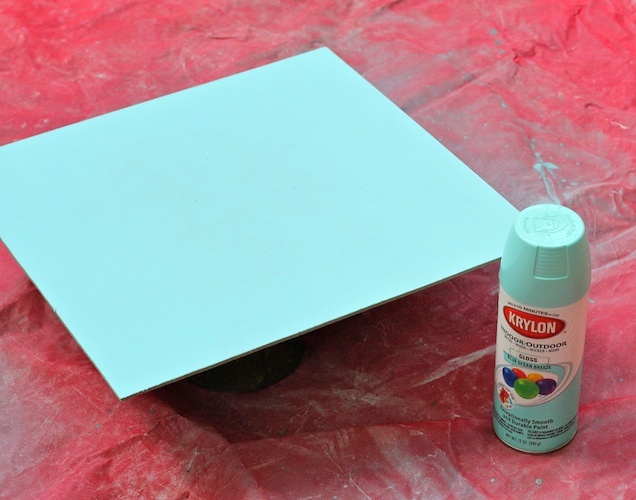 Paint over the entire surface with your second, darker color of spray paint. Do many light layers to keep a nice smooth finish. Work in a well-ventilated space. Be sure to paint the edges as well. Allow the paint to dry. Carefully peel off all the remaining tape. Have fun finding a home for your new painting! Oh Marji, that is just too cool! Love it! And it was easy, too! Give it a try. Glad the tape worked for you well, I have used it in every room in my house and sometimes epic failure. I have used it for various art projects to and sometimes it has left a residue behind. Love this project! Cant wait to try it out on my own. It is a good project to use the tape on because it doesn't matter if it leaves a residue. Did you find a residue when you left in on too long? I haven't used it a lot in room painting- just around trim, and it has helped me a lot. I love this! So simple and striking. Great tutorial! Thanks! Striking is a good word for optical art. Certainly not peaceful! Your art work is fabulous and so the the vignette you placed it in! Thank you for sharing your gorgeous project at Potpourri Friday! Hoping you will make it a weekly or regular party stop! Thanks Honey. Vignettes are not my strength. Still working on the good balance. My favorite part is your rock-lamp, though! Thanks Crystelle. 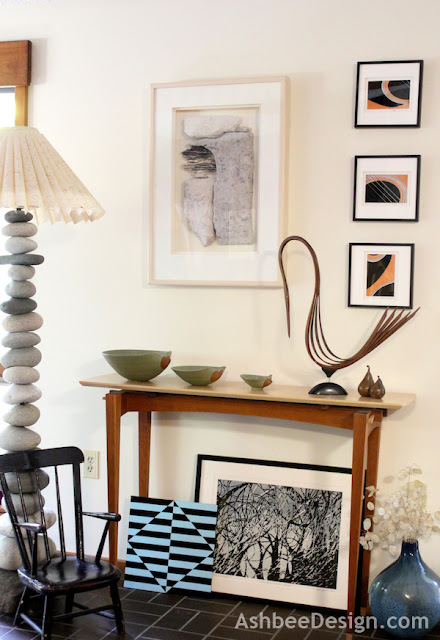 My husband and I made the lamp last year, and I even did a blog tutorial here. Check it out. Now that was a project!